This entry was posted in Computer, Knowledge, Technology, Ubuntu and tagged AWN, Desktop Customization, GNOME, Ubuntu, Wallpaper. Bookmark the permalink. ← What is Compiz, Beryl, Metacity & Emerald etc. in Ubuntu? it’s cool desktop theme. I need it. Heya! This was just what I was looking for! Works great! Except for the fact that even with Avant I cannot get my desktop icons back, and can’t seem to make any new ones. Though, this could all be to the fact that I’m a real Linux n00b. Dude, did you type that from a cellphone? Grow up and use complete words and capitalization. 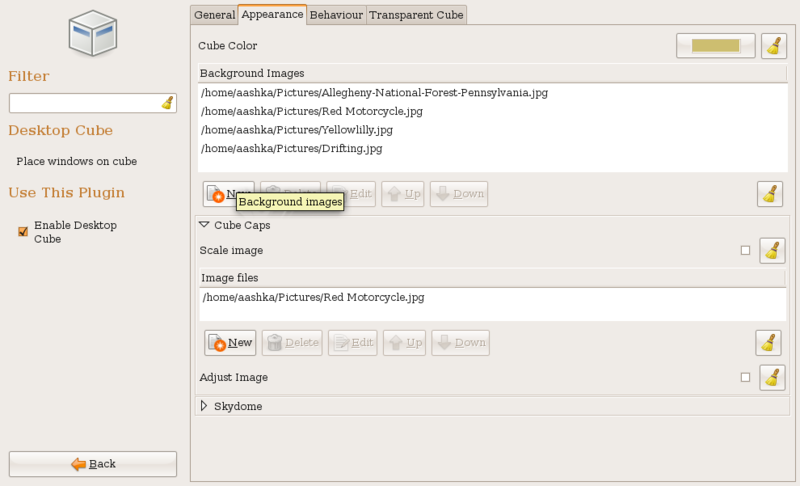 Unfortunately I don’t have “Background Images” in ccsm Desktop Cube >Appearance section. Can you advise how to install it? Thanks. I followed your manual but i only get my first wallpaper on each side of the cube. For anyone who does not have the Desktop Cube >Appearance section, just go to Utility > Wallpapers. I think they changed it around with the new Compiz update. OK good now how do i get my desktop back when i want it back??????????? Just undo step # 10. Works out of the blue ! This is what I was looking for. Thank you ! This is sweet. I’ve looked at some threads on this and quite a few seem dumbfounded. I don’t care about the desktop icons, but I am a bit sad that the panel transparency no longer shows the wallpaper behind it. Thank you so much for this information. You are godlike. I am happy that the article helped some of you. I tried it with ubuntu 8.10, it doesn’t work. and I tried to show my desktop icons again checking the show desktop in nautilus preferences, but my desktop doesn’t come back. how can I bring my desktop icon back? 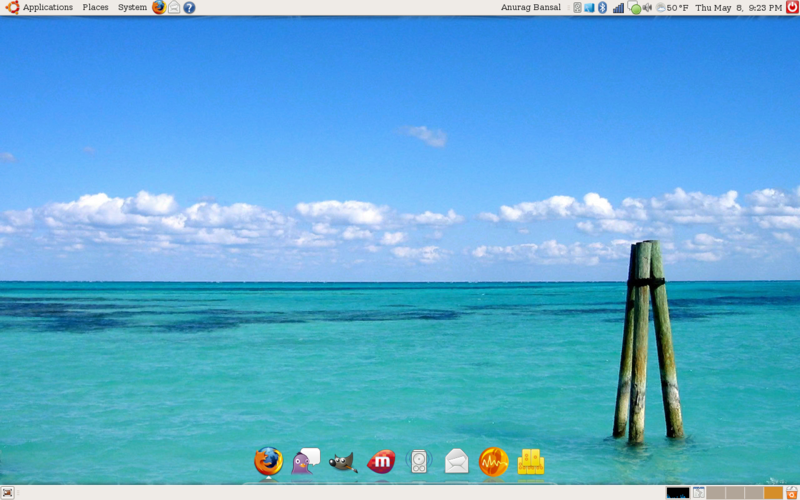 Ubuntu 8.10 does allow this desktop tip with Compiz Fusion. Desktop items will still appear in “desktop” folder. It would be a neat hack to do this tip and still allow items visible on the screen desktop. Make a shortcut to “desktop” folder on your panel or dock, saves a couple steps. Cheers! Hi, my ccsm doesn’t have option background images. What about that background you have ? can i get it ? The sea i mean …. anyone knows where to get it ? Somehow it didnt work. It was because I had already had wallpaper checked on the compizconfig settings. it actually made all of my workspaces that picture. I unchecked it and followed all the steps from the beginning and it didnt work. Just repeat step 10 to 11, over and over again… I had the same issue, but like someone said before, repeating the open gconf-editor+select+close, about 5 or 10 times, solved the problem! Is the point to just keep re-opening gconf-editor, or should I shut the terminal window off and restart that every time, too? I’ve selected/deselected “show desktop” ten times, no dice. Also, you have it as “gconf-editor+select+close. Does “select” mean to go through the process of checking then unchecking each time, or is it more like gconf-editor+select+close+gconf-editor+deselect+close, etc? i’ve deselected the “show desktop” options from gconf, and set 4 picture for the cube on ccsm… but the changes don’t appear. what do you think?? @riz: did you add the wallpapers to the “Utility” -> “Wallpaper” tab? The instructions really should be updated for Ubuntu 8.10 so that people would know how to do it (or they should read all the comments). There is no background image option in the latest version of ccsm. I use Ubuntu 8.10 Any other way to make that work? ya okay I got it. Its been moved to “Wallpapers” workd fine. hey, May I have your article on mine? It’s good article. Don’t worry, I’ll write this link as reference..
I’ve found the suggestion in by Marko, in 36, to be most helpful. How can i access my desktop icons easily now? where can i found something like a “folder bar”? Hey Guys, is there a way to get the four wallpapers and still have the transparancy (for things like taskbars and conky) work? Nice walkthrough – and worked first time. Thank you! i am running 9.04 ubuntu and my compiz doesn’t give the option to change my background like that. it only gives me cube caps and sky dome. what do I do? This doesn’t work in Jaunty. The desktop cube doesn’t even have an option for backgrounds. Only Cube caps and Skydome. Does anyone know how to do this in Jaunty? k, i tried this while i had the sphere going. Once i tried this i can get the cube back but not the sphere or cylinder. No problems but the first picture on the list displays as my “cube cap”, not a wallpaper, and none of the other pictures appear at all. My original wallpaper still covers all. I did follow the steps, disable my wallpaper, and my icons and right-click ability did go away. If you have any suggestions please email me at Penguin-Guru@heathgroup.net. Just getting the obligatories out of the way, I am not new to linux but I am also not a technical user of it so much of the lower level workings I do not claim to understand. Using 10.04LTS and unable to change backgrounds on multiple desktops. You’ve got to go under System -> Preferences -> CompizConfig Settings Manager. From there, just click on “Utility” on the left side of the window, then “Wallpaper”. Add the images in order that you desire, and it will work. i have 10.04 and the CCSM is a bit different here as well…. does any one know how do get the desktops to work here?? @all 10.04 users, follow DragonDon advice and restart your pc. It’ll work ! I don’t have the wallpaper option under Utility, in CCSM (10.4). Is there something needed to download? or any other way to have different wallpapers? Who are all having 10.04, Open the System -> Administration -> Synaptic Package Manager after that search “compiz” it will show you number of items in that please select compiz-fusion-plugins-extra and select and Apply after that you will see the Wallpaper in the CompizConf Setting Manager under Utility. If you want to change the Wallpaper, you should go to Utility -> Wallpaper then change the Wallpaper then and there. how do you get to Utility? i dont find back ground images in Appearance after the desktop setting so please tell me another way for applying wallpapers…. This isn’t working for some reason, only the top of the cube has one of the wallpapers that i want, the rest are the default wallpaper, how do i change this?? I had to Ctrl-Alt-F1 to the console and back again before this worked properly. Before that, the screen was being corrupted after desktop switches and application switches, not redrawing the screen properly. After moving away form X and back, it works well. 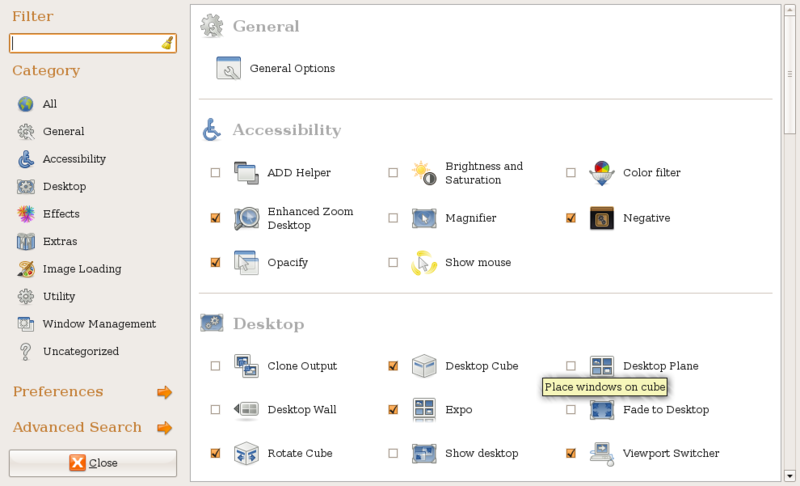 It is a bit frustrating not having nautilus handling the desktop as the nautilus context menu is handy. it doesnt works for me….. I have tried this on Ubuntu 9.04. I was able to get the desktop cubes and avant to work with Compiz. But it was all for naught. Once I enabled dual monitor, using ATI driver I was not able to have dual monitors using desktop cubes and avant. Also, primary monitor changed and when I edited the xorg.conf directly to change, it set the primary, and then trapped the mouse in the primary monitor. I have Ubuntu 10.10. I’ve followed the procedure to the letter but nothing happens. Things just freeze on screen.Fortunately I can still get to gconf-editor to re-check show desktop and it clears up but that just gets me back where I started with one wallpaper. For those that do everything and it does not switch over, do not run the gconf-editor as sudo. I was using sudo and nothing would switch. When I ran it simply as gconf-editor it switched immediately. 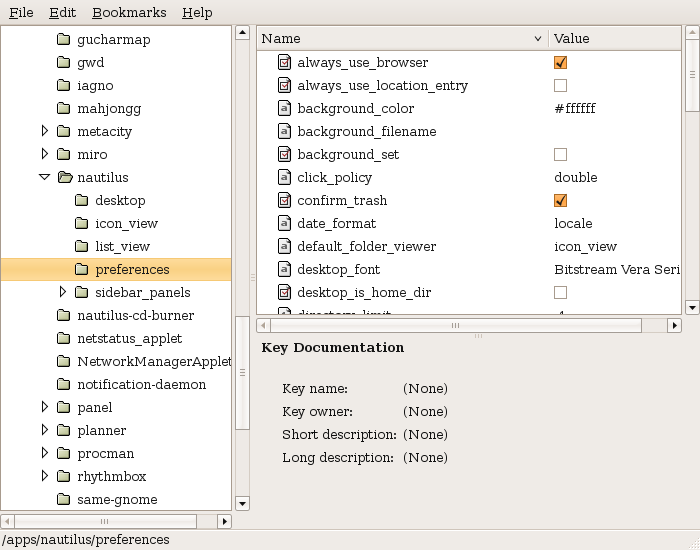 gconf-editor settings will generally apply to the user that it launches under. So sudo probably made it use the root home directory. Gave me some issues. Switching desktops through cube didn’t work. Didn’t show additional backgrounds. Rebooted… cube worked, but backgrounds gone, and only skybox showing. Menu’s not refreshing correctly…. I’m sure I’ll figure it out later though. Part of the problem may be that I’m on 10.10. Just a heads up that it may not work perfectly right off the bat. It worked nice on LinuxMint 11, with a few adjustments: had to go to CCSM -> Utility -> Wallpaper and add the wallpapers there. It worked perfectly! It would be better if I didn’t have to give up on desktop icons, though. Any news on transparent desktop rendering with Nautilus? 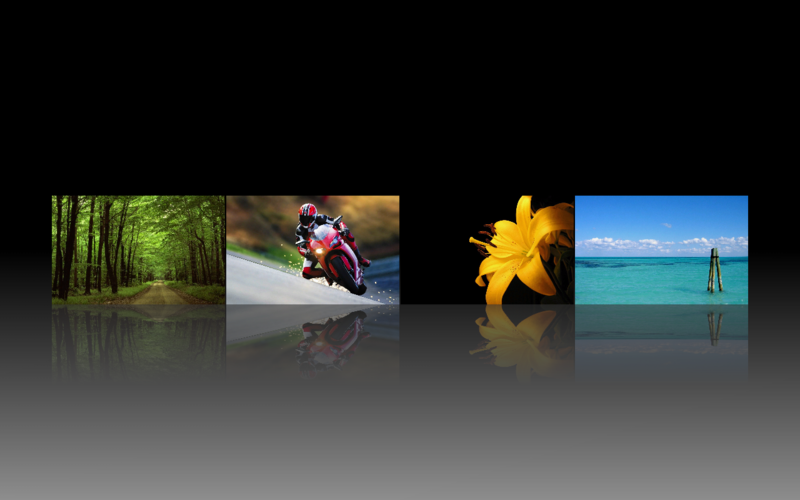 I have done all the setting still i am not getting different wallpaper on different workspace. Actually i installed it earlier at that time it worked but when i switched to ubuntu unity in 11.04 it hanged so i uninstalled it.